SELLER NOW OFFERING TO PAY HALF OF CONDO FEES AND UTILITY FEE FOR 2 YEARS. Magnificent and spacious with open and airy character. 1 bedroom residence in a superb Wash West location, with a 99 WalkScore and lovely courtyard with heated pool. 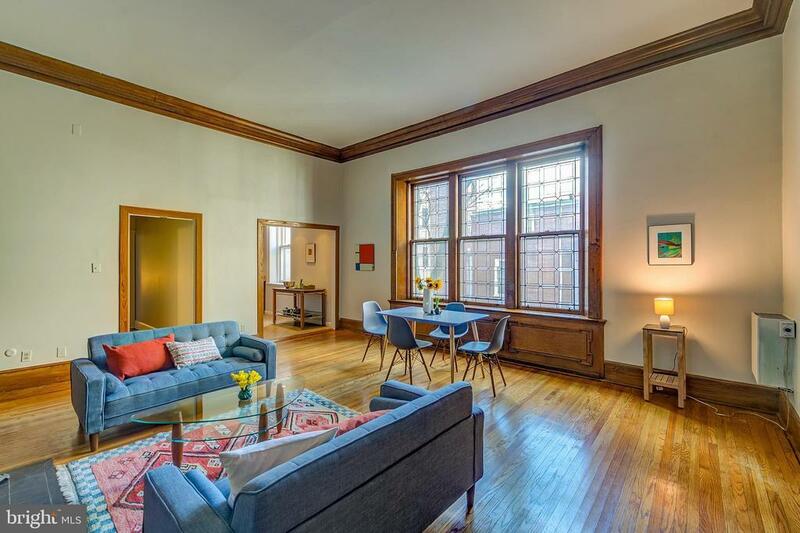 This gorgeous, spotless condo has spectacular character and detail, including super high ceilings, leaded glass windows, an original working fireplace, hardwood floors throughout, and exquisite built-ins, baseboard and crown moldings and original wood trim. The bright updated kitchen with stainless appliances opens to the large living and dining room with the fireplace and 3 charming leaded glass windows for excellent natural light. Big bedroom, modern bath, and excellent closet space. Strickland Row is a most desirable, professionally managed building. It offers a clean, spacious laundry room, bike storage, and a huge shared roof deck with great city views. Within blocks of Whole Foods, ACME, Center Citys best restaurants, shopping and coffee shops. Not to mention all the hospitals and universities are an easy walk, bike, or SEPTA. Notes: Multi-zone HVAC maintained by condo. Excellent building management with designated property manager. Condo fee is $535/month PLUS $200/month Utility Fee(PLUS average of $30/month electric plug-ins). This covers ALL UTILITIES, and of course insurance, roof, unit HVAC maintenance, all building maintenance, pool and landscaping, professional management, capital reserves, etc.